Gogeta is the fusion of Vegeta and Goku. They used the fusion dance for this and created Gogeta! 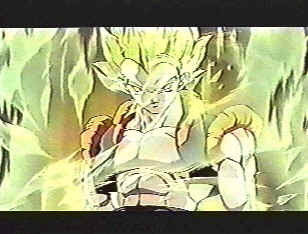 Gogeta was first seen in movie 12. Ssj3 Goku was unable to beat the evil entity Janemba, and neither was Vegeta. They were forced to fuse, the first time they got it wrong and ended up with a fat version of Gogeta, but the second time they did it right and formed the perfect Gogeta. He easily defeated Janemba. The next time we see Gogeta is against Evil Shenlong in GT. Gogeta goes ssj4 also. When he goes ssj4 his hair goes red, and his eyes red also. I think he gets a little fur on him too. Gogeta also isn't as strong as Vegetto is. Vegetto is a perfect fusion were neither warrior had to be at or near the same power level (because of the earrings). 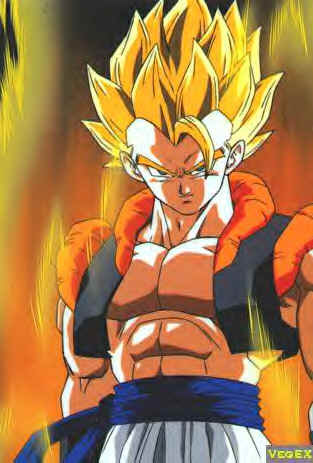 When forming Gogeta, Goku and Vegeta had to be at the same Power level. That meant Goku had to lower his to match Vegeta. That would result in a less powerful (but still extremely strong) fighter. 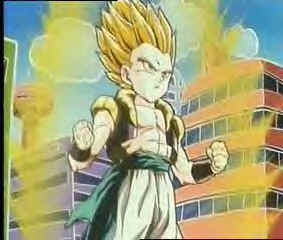 Gotenks is the fusion of Goten and Trunks. They used the fusion dance for this and created Gotenks. His most powerful stage was Super Saiyan 3. Gotenks was first seen in the Buu saga andturned super saiyan 3, but still was absorbed by Buu. Gotenks never really shows up again after that but that seems to be because after kid Buu blows up the Earth, Goten and Trunks never or hardly ever hang out anymore. Vegetto wasn't really a person seen a lot! He has the best voice in the Dragon Ball series by FAR, it's doubled. This is the fusion of Goku and Vegeta with the potara earrings on. Vegetto was absorbed by Buu, which was the only way that they split up. Vegeta then took his earring off, and crushed it. Goku did the same. That was basically the end of Vegetto! Gogeta is a lot weaker than Vegetto because when performing the Fusion Dance (with out the earrings) the 2 people have to be about the same power level so Goku lowered his power level down to match Vegeta's which makes this a bit weaker fighter (yet still a good one). Yet Vegetto when u have the earrings you don't have to be at the same power level which makes Vegetto a lot stronger than Gogeta. People have emailed me saying that Gogeta is stronger than Vegetto. And they are correct. But they are only correct in the term that Gogeta went Super Saiyan 4 and Vegetto didn't. That is one of the ways Gogeta became really powerful. But if a Super Saiyan Vegetto and Super Saiyan Gogeta were to fight, Vegetto would clearly win. The two fighters must be similar in size, build, and power (especially power; they have to be almost exactly the same, but this isn't a major problem, since most of the warriors can control their power levels, so the stronger fighter just needs to lower his/her power to match that of the weaker). The dance must be performed correctly for a successful fusion. Any minor mistake in the dance can result in a defective fusion. The fusion will last for 30 minutes, by which time both fighters will return to their normal selves, but there doesn't appear to be a way to end a fusion before this 30 minute time limit. After a fusion ends, the two fighters must have a waiting/resting time of one hour before the fusion dance can be performed again. Must have set of Potara Earrings. Need to wear on opposing ears. When Vegetto was absorbed by Buu it affected the power of the earrings and Goku and Vegeta unfused. Info by Rudyass321. "The fusion Dance is called Fusion-Waza. 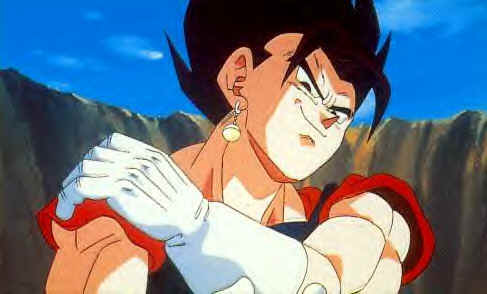 The Potara earrings are created by Dai (master) Kaioshin, but they are not called that. They are called the Potara Earrings."